According to some new research out of the Harvard Business School, 10% of Twitter users account for 90% of all tweets, and the median number of tweets per day is 0.01. That makes me above average! Barely. I think my last tweet was sometime in April. Although men and women follow a similar number of Twitter users, men have 15% more followers than women. Men also have more reciprocated relationships, in which two users follow each other….Even more interesting is who follows whom. 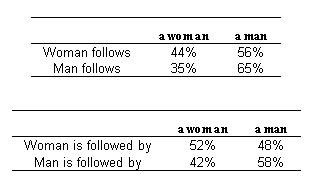 We found that an average man is almost twice more likely to follow another man than a woman. Similarly, an average woman is 25% more likely to follow a man than a woman. Finally, an average man is 40% more likely to be followed by another man than by a woman. However, it turns out that the researchers are suprised by this because apparently it’s unusual: “On a typical online social network, most of the activity is focused around women — men follow content produced by women they do and do not know, and women follow content produced by women they know.” Maybe so, though I suspect this might have to do with a massive bias toward teenagers in most social networks. Certainly these results seem to match similar patterns in Usenet, chat groups, the blogosphere, and real life. Frankly, I would have been surprised if men hadn’t turned out to be pigs.